Kairos Minerals (ASX:KAI) has expanded the prospective gold-bearing conglomerate located along strike from its recently reported gold nugget discovery at the Croydon Project. KAI informed shareholders today that visible gold has been identified in stream sediment pan samples, extending the anomalous footprint associated with the recently discovered nugget patch at the Mount Roe Basalt-Conglomerate-Basement unconformity to a strike length of over 4km. A total of 89 streams were sampled in the campaign, with ~35% reporting visible gold in pan samples. The update comes on the back of ‘outstanding’ early progress on the recently commenced geochemical sampling program, which examined the Mount Roe Basalt and older Archean basement immediately along strike from the nugget discovery reported by KAI on September 13 this year. Of particular interest is Sample 18WCST65, which reported some 50 gold ‘colours’/micro nuggets at the same unconformity between the above locations 2km south of the nugget patch. 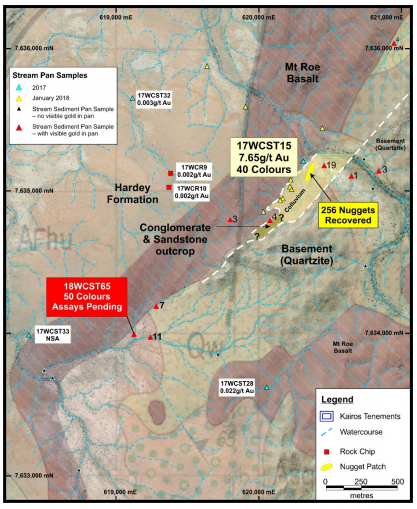 In addition, Samples 18WCST90 and 18WCST91 reported one and four gold “colours” in the same strategic position, 2km north of the nugget patch. Stream sediment geochemical sampling via helicopter identified multiple high-priority targets over a 22km strike length, between the lower Fortescue Group Rocks (Mount Roe Basalt/Hardey Formation) and the Archaean basement. The program was expanded to include prospective contacts of the lower Hardey Formation and the Mount Roe Basalt-basement unconformity across the broader Project area (below). 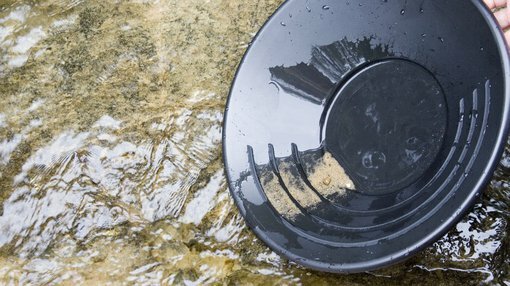 Previous stream sediment sampling in the region at site 17WCT15 returned 2mm fraction 7g/t gold. While the company awaits assay results from the program, it will turn its attention to follow up exploration work at the Croydon Project. This work will include further stream sediment sampling, metal detecting and detailed mapping. KAI’s Program of Works (POW’s) to undertake RC and diamond drilling on site have been approved, with additional POW’s submitted for trenching. Approval is expected in the coming weeks. It is important to note that KAI is itself a speculative investment, so professional financial advice should be sought if considering this stock for your portfolio. KAI Executive Chairman Terry Topping commented on the promising announcement, “Following the discovery of a nugget patch where we recovered 256 gold nuggets at the Croydon Project last month, our exploration teams have made excellent progress with an extensive geochemical-stream sediment program to test the broader potential of the conglomerate horizon located immediately along strike from this discovery. 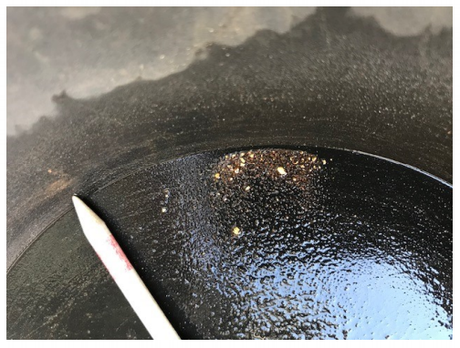 “The early results have been outstanding, with around 35 per cent of the 89 reporting visible gold in panned samples – including the exceptional sample 18WCST65, which was taken around 2km south of the nugget discovery and showed 50 colours. The Croydon Project is situated within KAI’s 100% owned Pilbara Gold Project in Western Australia, and is located 100km west of the Mt York Gold Project, where the company recently announced exceptional high-grade extensional results (KAI ASX announcement October 2 2018).